The magnetic field of Mercury is 4 billion years old according to data from NASA's MESSENGER spacecraft, which orbited the planet from 2011 to 2015. 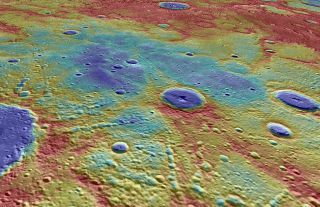 This MESSENGER image shows a view of Mercury's Suisei Planitia region (the blue colors), where MESSENGER detected crustal magnetic signals. Mercury has possessed a magnetic field for billions of years, and that field may have once been as strong as the Earth's, researchers say. The discovery, made by studying data from NASA's recently crashed MESSENGER spacecraft, helps whittle down scenarios for how Mercury has evolved over time, scientists added. The Mariner 10 spacecraft had revealed that Mercury possessed a magnetic field similar to Earth's, albeit one that is about 100 times weaker. The motion of liquid metal deep inside Mercury's core generates the planet's magnetic field, much the same way Earth's field arises. Mercury is the only rocky planet besides Earth in the solar system with such a magnetic field. "This means Mercury's core has to be at least partially liquid,"study lead author Catherine Johnson, a planetary geophysicist at the University of British Columbia in Vancouver,told Space.com. "This was a surprise at first, because Mercury is very small, so you would expect it to cool quickly after it formed and be completely solid. Scientists later realized if there was a little bit of nonmetallic stuff in Mercury's core, that'd lower its freezing point and make it hard to be completely solid." This diagram shows magnetic field lines (in white) from magnetized rocks in the crust of Mercury.The phenomenon was detected by an instrument on NASA's MESSENGER spacecraft during close orbits of Mercury. This new finding regarding the magnetism of Mercury comes from MESSENGER. Launched in 2004, MESSENGER was in space for more than a decade and orbited Mercury for four years, yielding troves of data about the enigmatic world. Once MESSENGER ran out of fuel, it crashed into Mercury, likely gouging a crater in the ground about 52 feet (16 meters) wide. "The mission was originally planned to last one year. No one expected it to go for four," Johnson said in a statement. The researchers analyzed magnetic data collected by MESSENGER in the fall of 2014 and 2015, when the spacecraft flew incredibly close to the planet's surface, at altitudes as low as 9 miles (15 kilometers). In contrast, the lowest that MESSENGER flew in previous years was between 125 and 250 miles (200 and 400 km). "The signals we detected are really small, and very, very hard to measure. We'd never have been able to measure them if not for these really risky low-altitude observations in the last few months of the MESSENGER mission," Johnson said. The scientists detected magnetized rocks in a part of Mercury's crust that, due to the presence of many craters from cosmic impacts, appears to be quite ancient. The researchers suggest the rocks were once magnetized by the planet's magnetic field, and based on the age and amount of the magnetized rocks, as well as how strongly they were magnetized, the investigators deduced that Mercury's magnetic field has persisted for 3.8 billion years. This view of Mercury from NASA's MESSENGER spacecraft looks west across a linear scarp that separates two different terrains, one higher on the right (in red and yellow) and one lower at the left (in blue colors). This finding suggests that Mercury's magnetic field evolved over a long time. That conclusion sheds light on the planet's composition and structure and how it may have cooled and evolved over time. "Being able to pin down how long Mercury has had a magnetic field helps us narrow down scenarios for the early history of Mercury and how it has changed over time," Johnson said. "This in turn helps us understand more about planetary evolution in general." The scientists detailed their findings online May 7 in the journal Science.